Every spring, artists, designers, and creatives alike gather from all corners of the globe to debut new product collections and unveil inspired installations at Salone del Mobile in Milan—the biggest design show of the year. While there’s plenty of trendspotting to be had, we’re always itching to see what major fashion houses bring to the table. This April, we have our eyes on Versace. The iconic Italian brand—which first launched its homewares collection in 1992—will be teaming up with NYC-based interior designer Sasha Bikoff and Canadian artist Andy Dixon to bring this season’s exuberant installation to life at Versace’s palazzo in Via Gesù. According to WWD, Bikoff was primarily inspired by the brand’s fall 1994 campaign for this year’s set, which, if the first sketches are any indication, is bound to be cheeky, whimsical, and a recipe for a throwback. Bikoff’s eye-popping penchant for French Rococo, ’80s Memphis, and every bold aesthetic in between will decidedly lend itself to some of the bolder pieces in Versace’s collection like the Pop Medusa chair. Available in a range of punchy hues, the indoor-outdoor piece is crafted from a weather-resistant polyurethane and boasts the brand’s iconic Medusa motif on the back. Based on Bikoff’s renderings for the space and her color-forward approach to spring, yellow will play a major role in her fantasy setting. 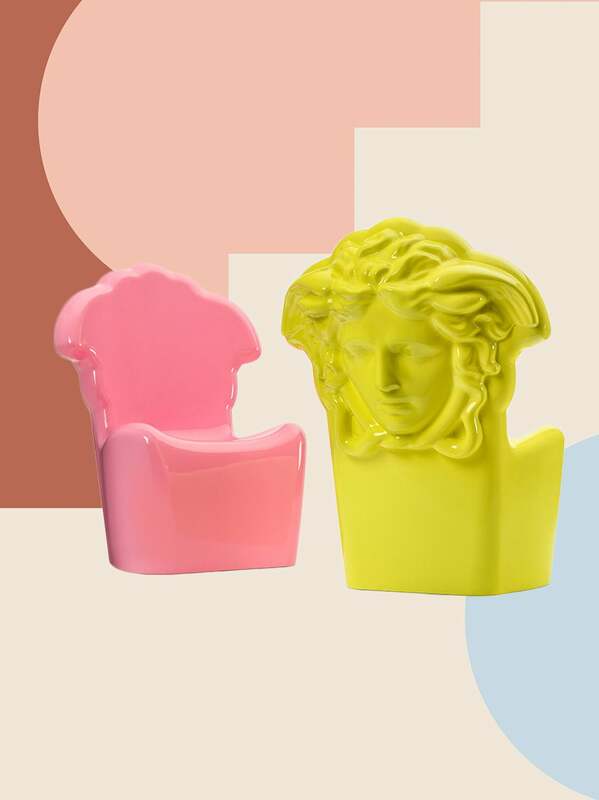 Candy-colored chairs are just the beginning for Versace’s 2019 collections. The fashion house is also set to debut an outdoor line called Jungle this year. Comprising of outdoor sofas, armchairs, lanterns, and more, the tropical lineup will bring back the now-infamous botanical print that Jennifer Lopez donned at the 2000 Grammys. While Versace’s Italianate glamour might not be for everyone, we can think of a handful of celebrities who will want to scoop up this year’s pieces ASAP. Seemingly inspired by Under the Tuscan Sun, Lady Gaga’s Malibu mansion exudes Italian countryside living. So it’s only fitting that the A Star Is Born actress owns what appears to be a Versace-designed china set in her rustic-chic dining room. Do you really think J.Lo will be able to resist the urge to deck out her new beachfront oasis in her all-time favorite pattern? Hopefully, Lopez’s interior designer (*cough, Joanna Gaines, cough*) is on board with Versace’s bold Jungle sofa. No stranger to Versace’s Medusa iconography, we can easily see Bey translating her fashion fixation to the patio with the brand’s playful pink and yellow chairs. Already in a Memphis mood, Kelly Wearstler seems to be gearing up for what’s to come at Versace’s palazzo in Milan. Retro-chic is something the long-reigning champ of California cool knows well, which is why we expect Versace’s bodacious show to leave her wanting more. Is the Chrysler Building About to Become a Cool Art Deco Hotel?